Teachers and students warmly welcomed a delegation of Turkey's Maarif Foundation that took control of three Pakistani schools linked to Gülenist Terror Group (FETÖ) in the southern port city of Karachi. The handing-over ceremony was held Wednesday at the main branch of Pak-Turk Maarif International Schools and Colleges — formerly known as Pak-Turk schools — in Gulshan-e-Iqbal neighborhood of the city. 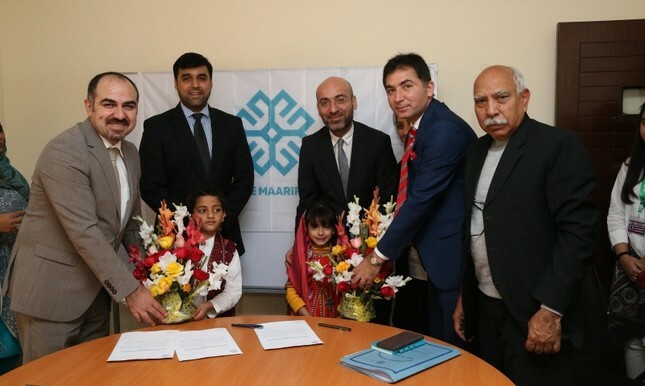 Mahmut Özdil, board member of the Maarif Foundation, and an official of the government of southern Sindh province of which Karachi is the capital, signed the documents which marked the official handing over of the schools. Selahattin Batur, country director of the foundation, Syed Israr Ali, senior director of Pak-Turk Maarif International Schools and Colleges, and others also attended the ceremony. Two students presented bouquets to the foundation members. Earlier, the delegation along with Turkish Consul General Tolga Uçak met Sindh Home Secretary Qazi Kabir at the latter's office. The consul general and the foundation members thanked the provincial government of Sindh for handing over the schools. The foundation has already taken control of FETÖ-linked schools in capital Islamabad and the second-largest city Lahore. Ankara accuses FETÖ of being behind a long-running campaign to overthrow the state through the infiltration of Turkish institutions, particularly the military, police, and judiciary. FETÖ has a considerable presence abroad, including private schools which serve as a revenue stream for the terror group.